Exchange Log Viewer is an expert software to open Exchange Transaction Log files and analyze data for forensic investigation. 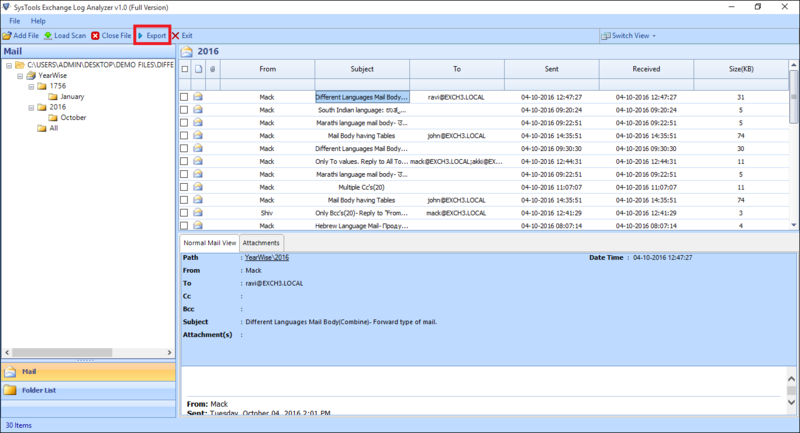 Exchange Log Viewer read Exchange Power shell logs on Windows PC effortlessly. The Exchange Log Viewer tool is compatible with all version of Microsoft Exchange Server 2000, 2003, 2007 (32 & 64 bit). It opens & scans Exchange Sever 2010 transaction log files. Open and read complete transaction log data for forensic analysis. The tool is compatible with all versions of Windows PC version Win 10 and below. The software can work with Exchange Server version 2000, 2003, 2007(32 and 64-bit). EDB.LOG file is essential to perform any analysis. This powerful algorithm is designed to restore emails using Exchange log file. The Exchange Log Viewer tool can even fix permanently deleted data without compromising integrity. A copy of the scanned data can be saved in the tool for the next time log files need to be opened. This saves time from scanning the EDB file again when reading and analyzing its data. The Exchange Log Management tool can save a copy of the Exchange transaction log data to format. 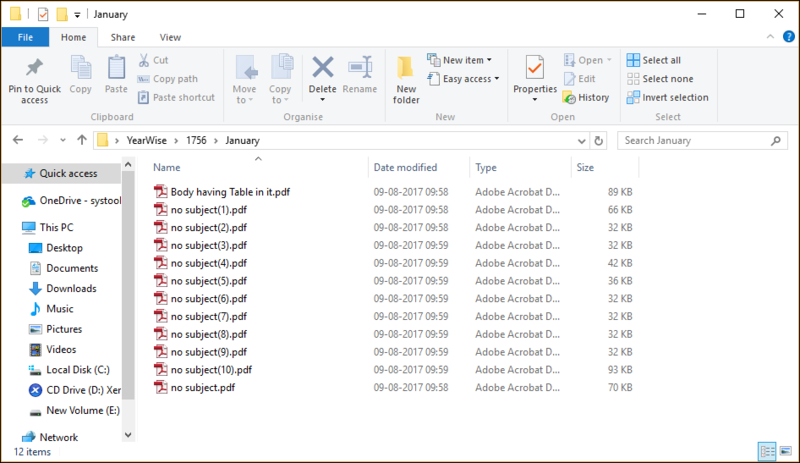 Export EDB.LOG to PDF to transfer server database log to the computer as an Adobe document. 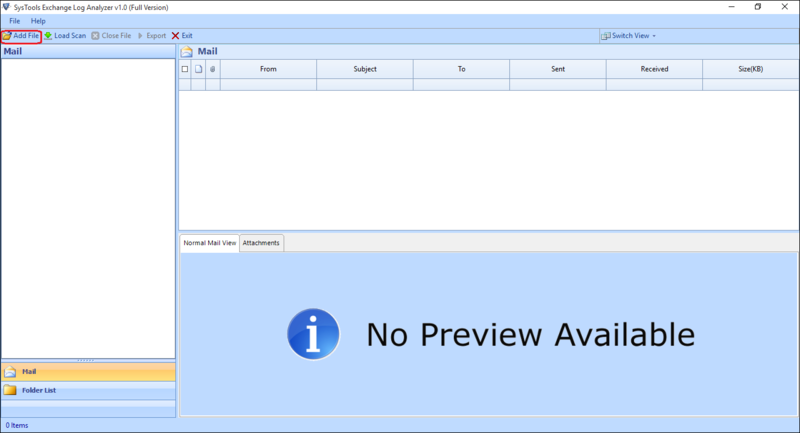 Save log as PST or MSG to import to Outlook and email data. Open database log through a browser by converting it to HTML format. The Exchange Log Analzer makes it optional to retain folder structure in the output format. If transaction logs are growing big is size, they can be migrated and backed up to external hard drive. The tool provides an option to maintain folder hierarchy to save time and frees EDB.LOG file for daily use. There is an option provided by the Exchange Log Viewer software to give unique names to resultant files. This is Naming Convention feature and found in the Advanced Settings section. It names exported files based on their Received Date, subject or serial number as decided by the user. The Exchange Log Reader makes it optional to retain folder structure in the output format. If transaction logs are growing big is size, they can be migrated and backed up to external hard drive. 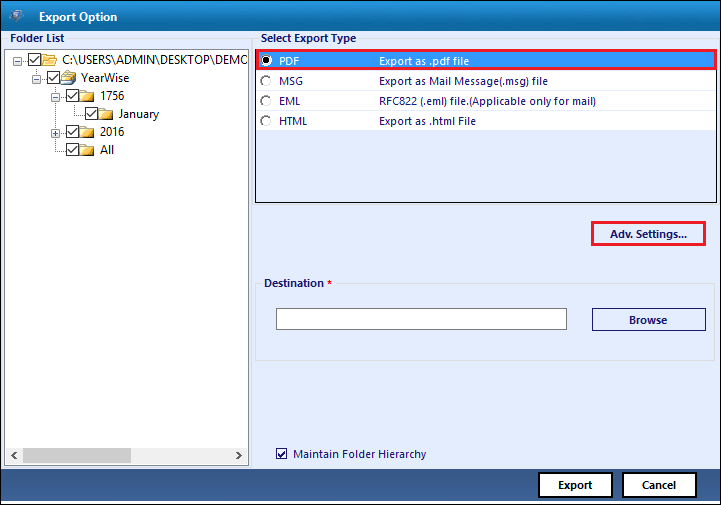 The tool provides an option to maintain folder hierarchy to save time and frees EDB.LOG file for daily use. How Does the Exchange Log Viewer Work? Step 1 : First, download and install the Exchange Transaction Log Viewer. 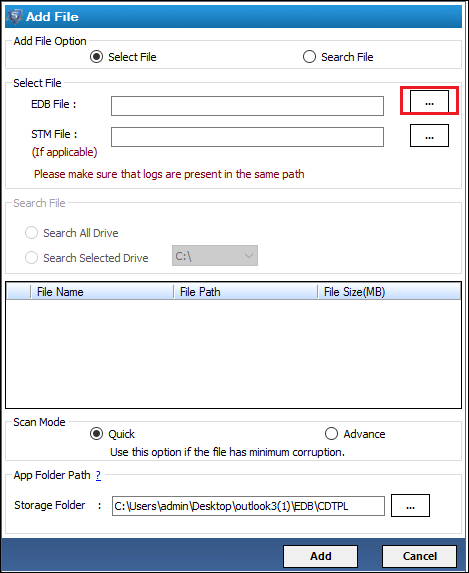 Then, open the application and click on Add File button to import edb.log file for analysis. Step 2 : From the Add File dialogue box, click on the ‘...’ button. Then, broken to the folder location where the log file is saved. Step 3 : Now, the scanning process will start displaying each file that is being scanned. 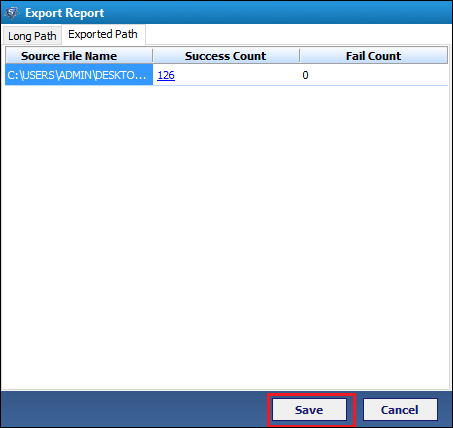 Step 4 : To save Exchange Power shell log to file, click Export button from the navigation bar. 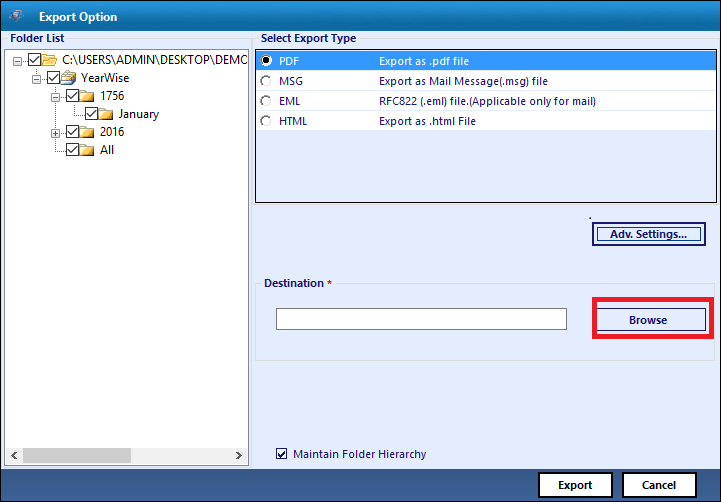 Step 5 : From the Export Options dialogue box, select the File type as either PDF/MSG/EML/HTML. Then, click on the Advanced Settings button. Step 6 : From the Exchange Log Viewer screen, set an appropriate Naming Convention for exported files. 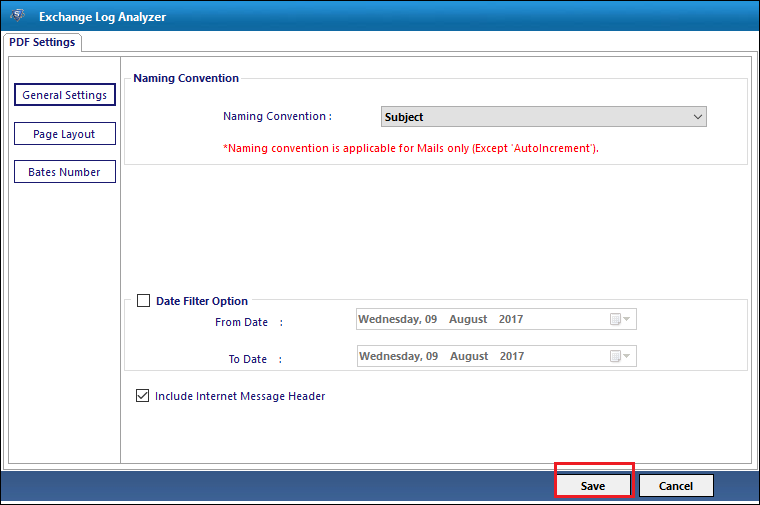 Also, one can apply a date filter for selective conversion and click on Save button. Step 7 : When the setting for Exchange Server Log Management has been saved, click OK button on the message box that pops up. Step 8 : Next, Browse to the folder location where the resultant files will be saved. 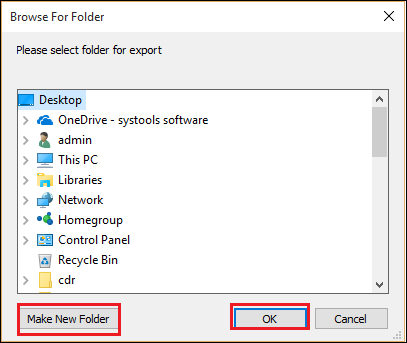 Step 9 : Create a new folder anywhere on the Windows PC, by clicking the Make New Folder button. After selection, click on OK button. 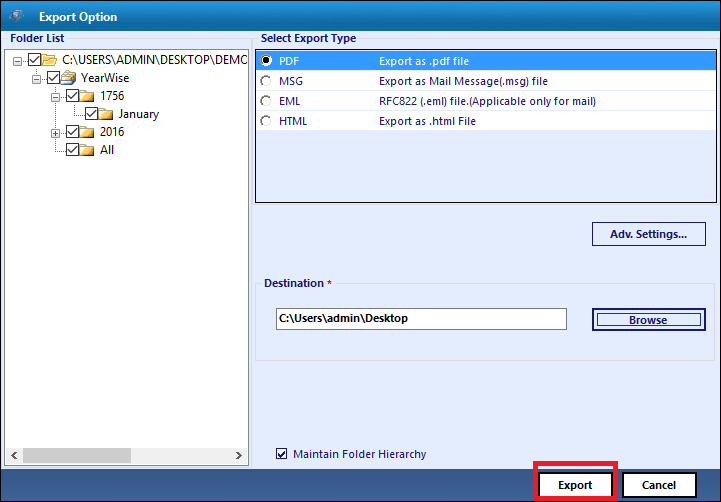 Step 10 : From the Export Options screen, mark the box for ‘Maintain Folder Hierarchy’ if folder structure needs to be retained. 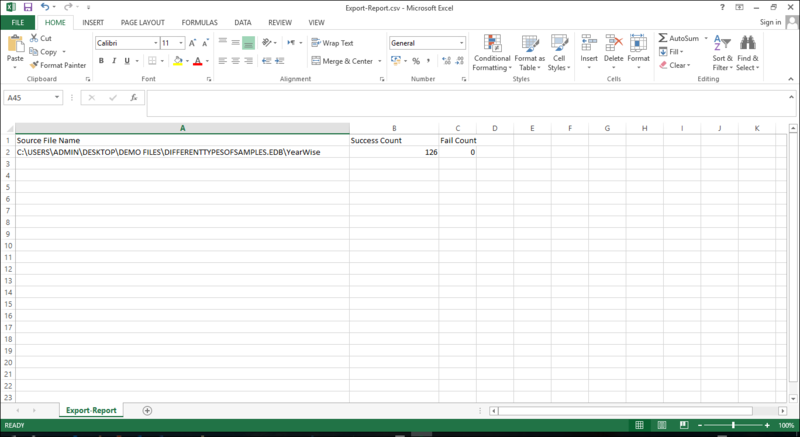 After making all the adjustments, click on the Export button to save Exchange Power shell log to file. Step 11 : Let the Export process run. A live status report of all the items being exported will be displayed with item folder count, item count and destination. Click on the OK button when the process is completed. 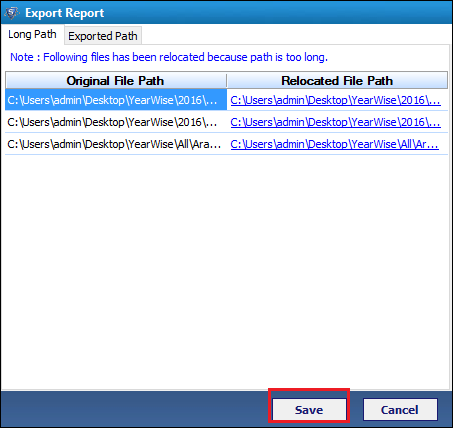 Step 12 : An export report is generated with Long Path and Exported Path. The Long Path contains source and destination folder location of Exchange server logs. Step 13 : The Exported Path contains the successful item count that has been moved from Exchange server to Personal storage file. 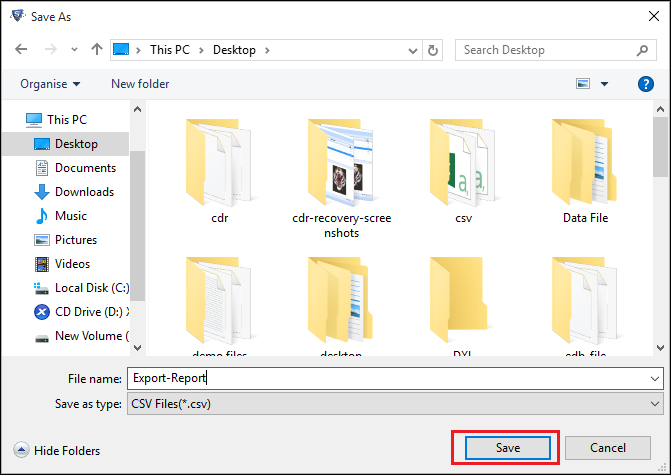 Step 15: Check the report by going to the folder path and double-clicking on the file. Step 16 : Finally, verify that the conversion process has been completed successfully. Q. Is the tool capable of analysing data from DAG, CAS or Witness Server Log? Ans: Yes, the Exchange Log Files Reader software can read and analyze log files created by CAS server, DAG server as well as Witness server. Q. Is Exchange Server environment essential for scanning transactions log from EDB.LOG file? Ans: The Exchange Log Viewer is capable of working without the server environment. Just install it on a Windows PC and you can open and view all the emails. Q. 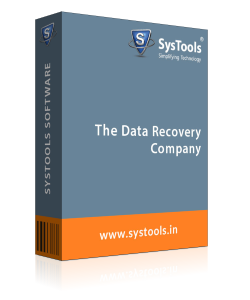 Is the data integrity is ensured for Exchange log files that are analyzed using this software? Ans: Yes, the Exchange Log Reader can retain the integrity of data and maintain folder structure in resultant format. Q. Can Exchange Log Viewer tool work with Windows Server 2008/2012 machine? Ans: Yes, the software is compatible with Exchange Server machine 2008 and 2012 version. Note: Exchange Log Viewer Software will get delivered on your registered email id, within few minutes after placing the order. Our company recently moved its base to another city. We were hoping to transfer all the log data to another format that can transport easily to our new quarters. The Exchange Log Analzer helped us do that. We were able to transfer more than 40 GB of data to PDF files. It was easier for us to manage transaction logs and Exchange server data. Thanks! Our company has been using SysTools products for a long time. We have PDF, Outlook and Word recovery tools for our routine Office needs. We just added Exchange Log Viewer to our collection. It can extract and save EDB.LOG file data. It can even save the scanning report according to the convenience of the user. The reason we were delaying the analysis for our transaction logs is that we were yet to find the right tool. It was suggested by our old partners to try the Exchange Transaction Log Viewer to scan Log files and it worked wonders. We were able to track each transaction on Exchange server and monitor it carefully. We also got an option to save files to PDF or HTML format for later review.